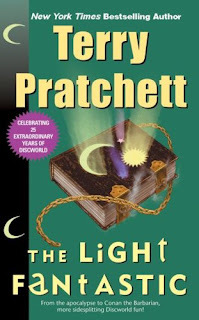 The Light Fantastic picks up after the end of The Colour of Magic and is the only direct continuation of a storyline in the entire Discworld series, resolving the cliffhanger from the ending of the first book. The resolution to that cliffhanger is slightly disappointing, to be honest, but given that Pratchett's goal here was to get the story moving again as fast possible, it's not too much of an issue. After that it's pretty much business as usual from the first book, with Rincewind and Twoflower's travelling around the Disc as they meet various eccentric people, almost die, have various misadventures and almost die. You know the drill. The storyline is a bit more focused this time. Whilst the first book was divided into four smaller chunks, The Light Fantastic is one big story (starting Pratchett's habit of refusing to use chapters) which flows quite well. As with the first book, Pratchett's targets here remain common fantasy tropes, with perhaps a bit more of a focus on taking the mickey out of fairy tales. Again, it lacks the subtlety of the later books and the humour is fairly broad, but again it's fairly entertaining. Pratchett also starts laying the foundation of the Discworld mythology here, with the first appearances of Cohen the Barbarian, the Librarian, Ysabel and the Four Horsemen of the Apocralypse. Events build to one of the most memorable conclusions in the series' history, a widescreen epic of a finale which I suspect Pratchett created just in case the success of the first book was a fluke and the series was not going to continue. Obviously it was a big success, and the rest is history. The Light Fantastic (***) is a satisfying sequel to The Colour of Magic and remains fast-paced, funny and entertaining. It's still fairly obvious in places, however, and lacks much of the depth the later books bring to the world. The novel is available now in the UK and USA. It was adapted by Sky One along with The Colour of Magic last year, and the TV movie is available now on DVD (UK, USA) and Blu-ray (UK).